Being the hugely successful football man that I am, I get quite a lot of spam email from betting companies and youtube channels owned by giant TV companies pretending to be youtube channels. Usually they want me to make them a video for free, or if they are really generous, very little money, but a few weeks ago I received this. 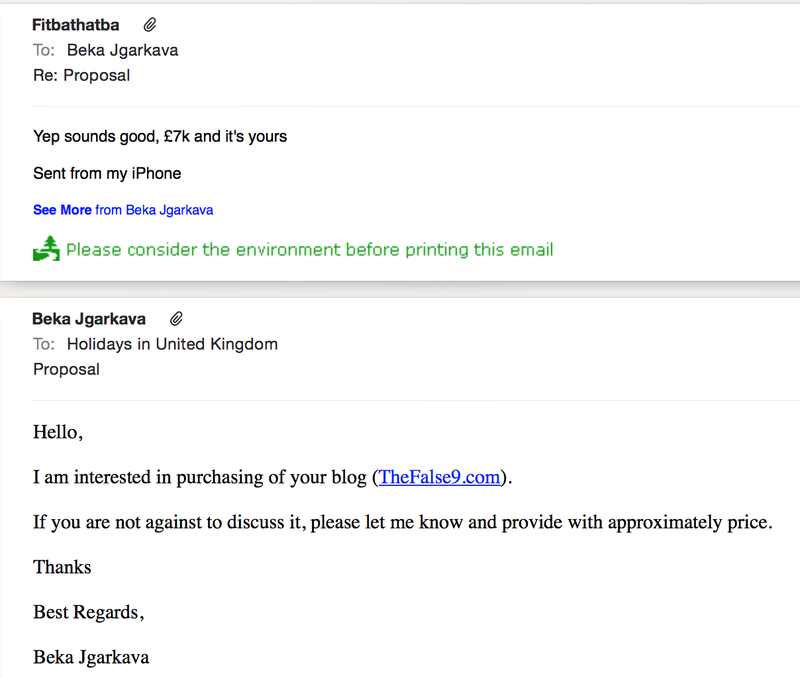 Now I don't know who Beka Jgarkava is but I will open any email that has an attachment. A bit like how I'll open absolutely any actual mail that is sent to my house with someone else's name on it. Someone I don't live with, I mean. Anyway. The first point of contention within this particular email, is Beka's opening line. Beka, who I assume is female (as in Rebecca) wishes to purchase my blog The False 9. 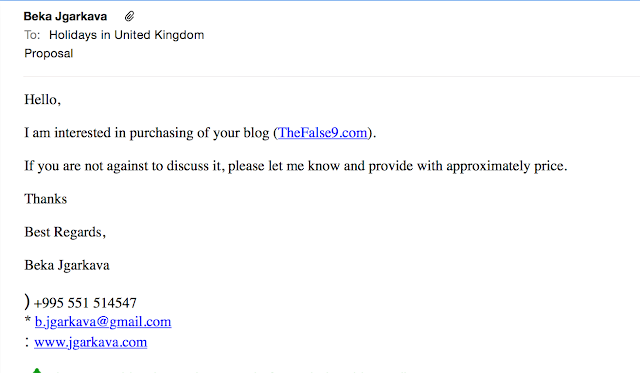 As you will be aware, dear reader, I do not own The False 9, nor read it, and as such cannot sell it to anyone - including Foreign Rebecca. Foreign Rebecca's English isn't perfect, but I don't speak any other languages well enough to construct an email like this and so can't really slag her off. 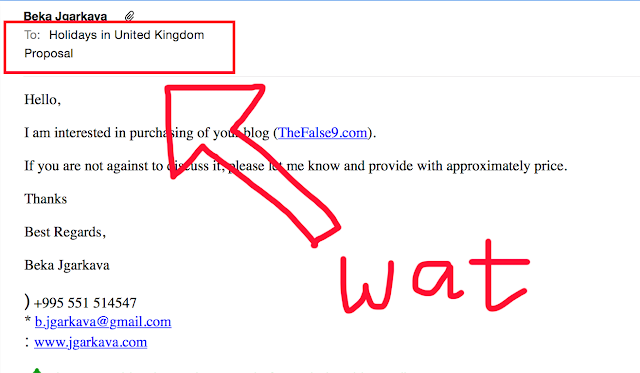 The rest of the email is just blah blah blah can I discuss the site blah blah blah. What the hell is this? How is Holidays in United Kingdom me? As of yet I have not received a marriage proposal but I look forward to getting it later, provided that Foreign Rebecca is hot. 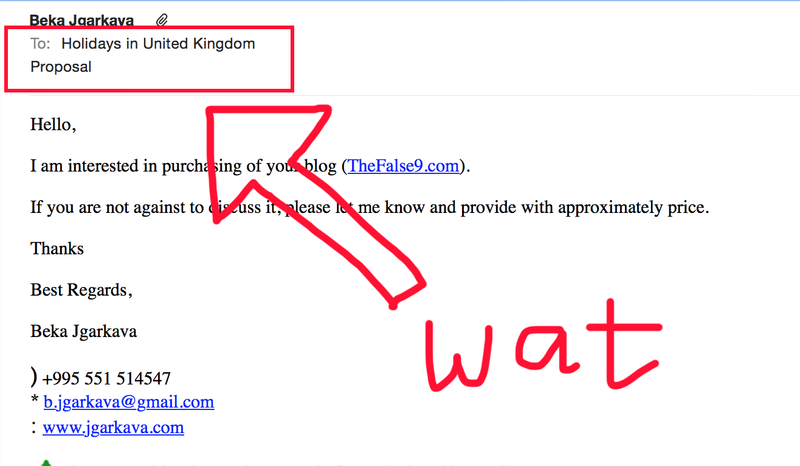 So yeh I've kinda forgotten where I was going with this and it's not actually funny but here's what I sent back. I thought £7k seemed like a reasonable price. No reply. That's it.